I love travel in the fall and this often takes me to new places near or over Halloween. Whether it's a Mickey's-Not-So-Scary-Halloween-Party at Disney or a Harry Potter festival, I'm always up for putting on a costume and having a good time. 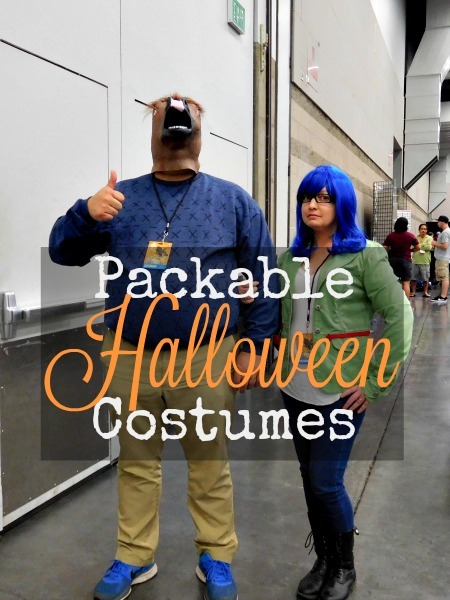 As a budget traveler though, I'm not willing to pack much extra where I have to check a bag to my destination, so I look for creative costumes that I can make out of things I can easily pack or am already taking with me. In the past, Eric and I have dressed as Wayne & Garth, an ice cream man, a sports fan, and this Halloween we'll be dressing in our Wizarding wear for both a Harry Potter festival and a night of magical science. If you're also looking for an easy, but still fun, costume to take in your carry-on, I've rounded up some of my favorites of the moment. Be fruit! 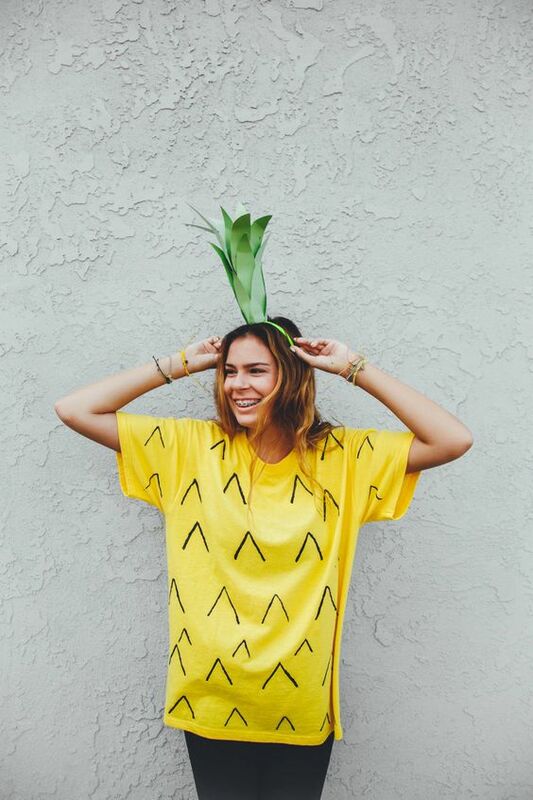 Pineapples are really in right now. I'm sure you can throw a spare t-shirt in your bag...and you could even wear it on your trip and then jazz it up afterward, allowing it to do double-duty. Use a Sharpie or fabric marker to create the little spikes you see and then add a headband with the crown to finish the look. 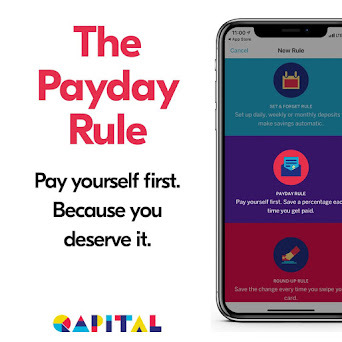 Click on the link if you need more help. You can also be a strawberry with a pink shirt and regular leaves on your head, be a kiwi without a headband at all. Do you and find your favorite fruit that this would work with. Ladies, you probably are already traveling with a little black dress. It's practically a must for travel of all kinds. Grab yourself some spare black fabric to make yourself some bat wings, throw on a headband with ears and you're done! Classy and fun! Click the link for instructions. 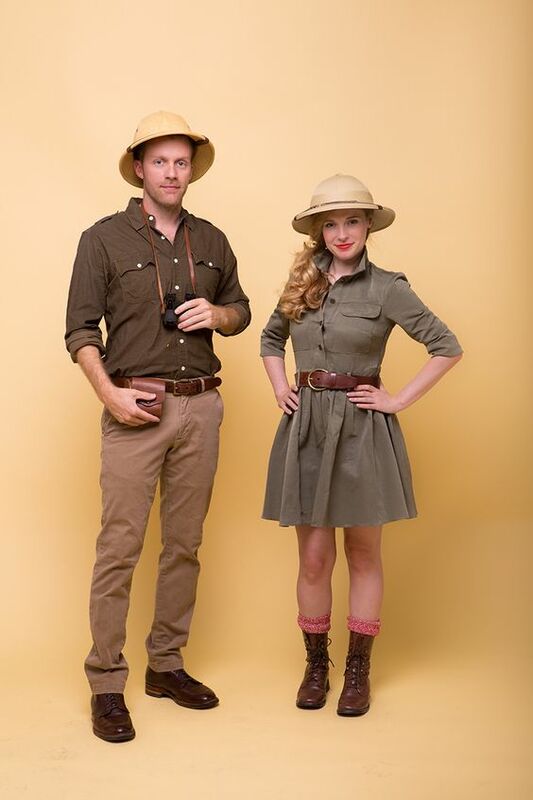 Eric and I always have khaki pieces in our wardrobe and one year we pulled all our items together to become travelers on safari. It worked for the warm California weather and was also creative. Go with green, brown or tan and add a hat and binoculars (we used toy ones that were small and easy to pack in shoes) and you're ready to spot some animals! Come on down! You're the next contestant on The Price Is Right! I love this awesome idea. Basically, you can wear whatever you have (bonus points if you make it a I ♥ Drew or Bob shirt of some kind) and then pack yourself a name tag and price guessing board. I adore anything that packs flat and takes up no room and you can just make one or as many as are in your travel party. Easy! If you have more of a morbid sense of humor like I do, then maybe going as roadkill will have you doubled over. 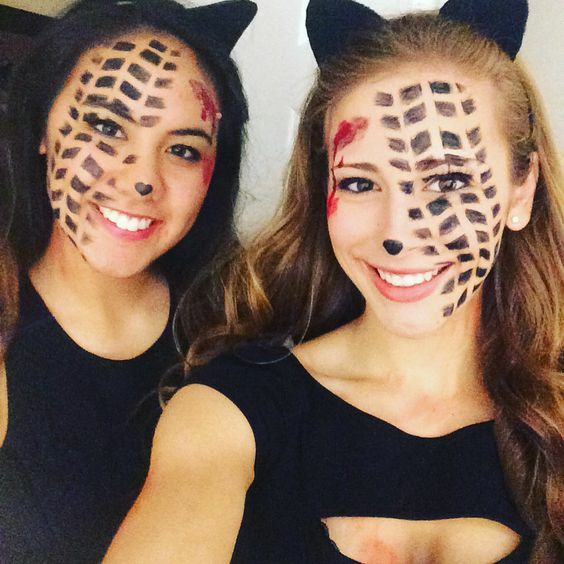 I think this is a clever and easy costume that you can do quickly with an appropriate stencil. If you also want to have tire marks on your clothing, go for it. The further you go with it, the better you're going to sell this outfit. Don't forget your animal ears and tail if you want to add that as well. 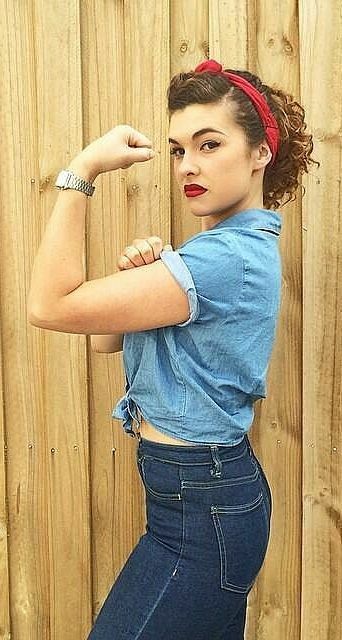 I include Rosie the Riveter in all my costume lists, because A. she's amazing and B. she's super easy to pull off. You probably already have everything in your closet and you can wear jeans or denim shorts, depending on the weather. Make sure to pack the perfect red lipstick though, because it absolutely completes the look. 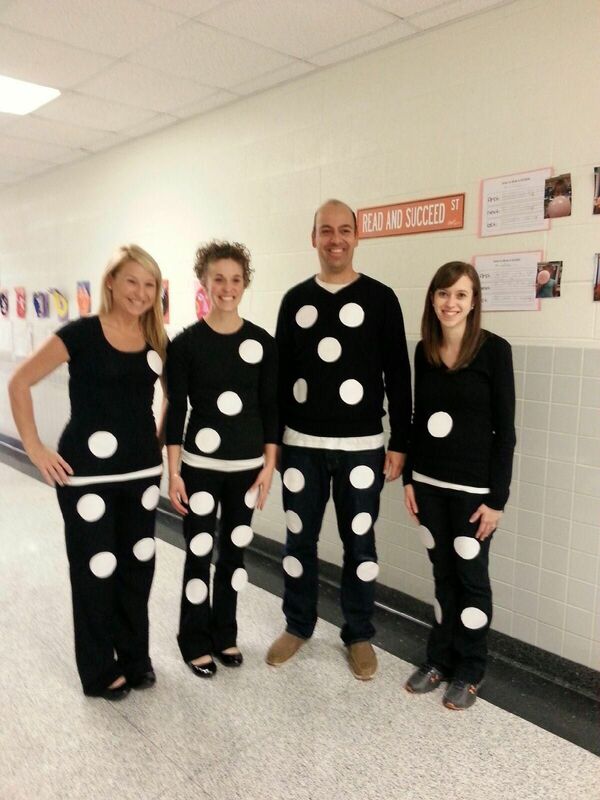 I never would have thought of this costume, even though I've been similar in the past. Dominos are creative and so simple! Cut out some white dots, affix them to clothing you already have packed that are black (don't forget that white undershirt that peeks out as the line) and you're Halloween ready. Use fabric tape for easy add and removal of your dots. Pig in a blanket! 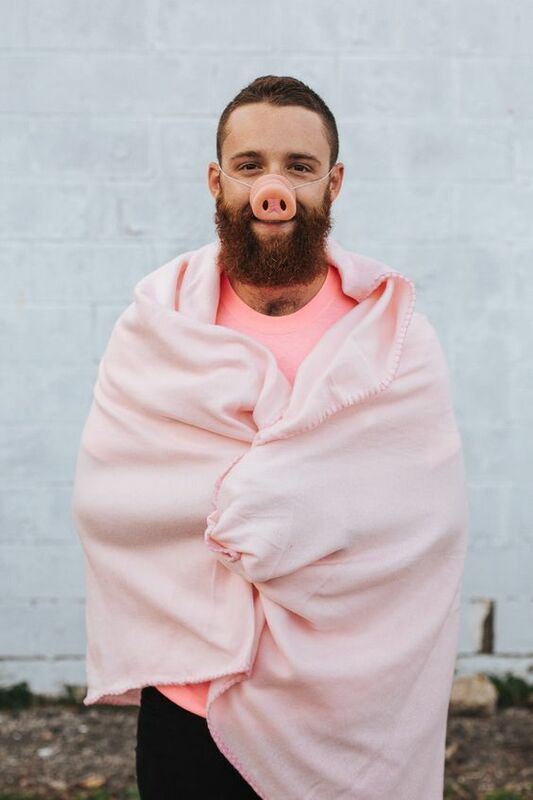 Either pack a cute little baby blanket or a large piece of fabric, put on a pig nose and you've got a costume everyone will love. Be a stick figure! This is another easy-to-accomplish outfit. 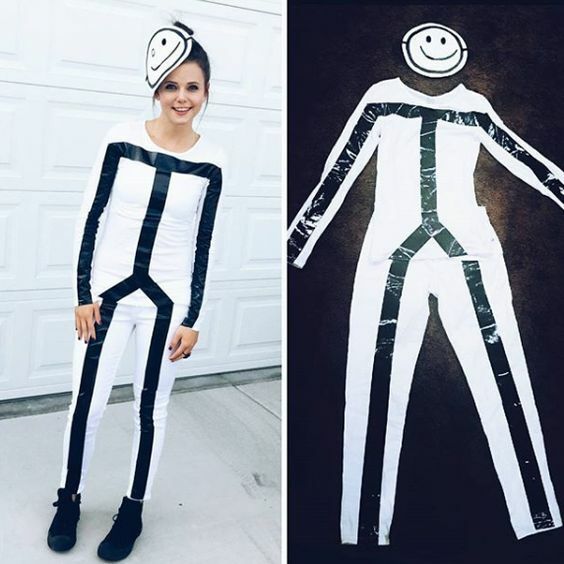 Pack a white outfit and some black tape. Stick on, wear out, pull off and wear other days of your vacation. Don't forget to make yourself a face mask. That cute outfit in your carry-on can turn you into a superstar! Throw it on with a black and white wig (the bigger the better) so it covers your eyes, or more, and a giant head bow. Voila! 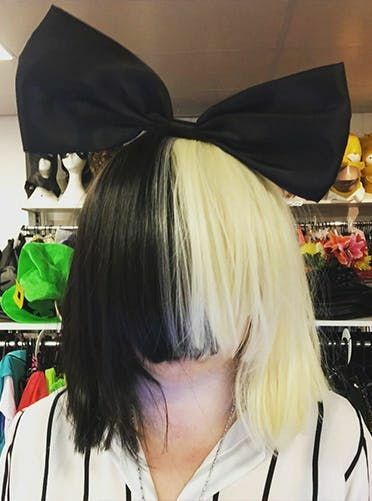 Now you're Sia. Bob Ross is having a revival these last few years. People love him, because he's so chill. Everyone can pull him off with a basic jeans and button down shirt outfit and a big wig. 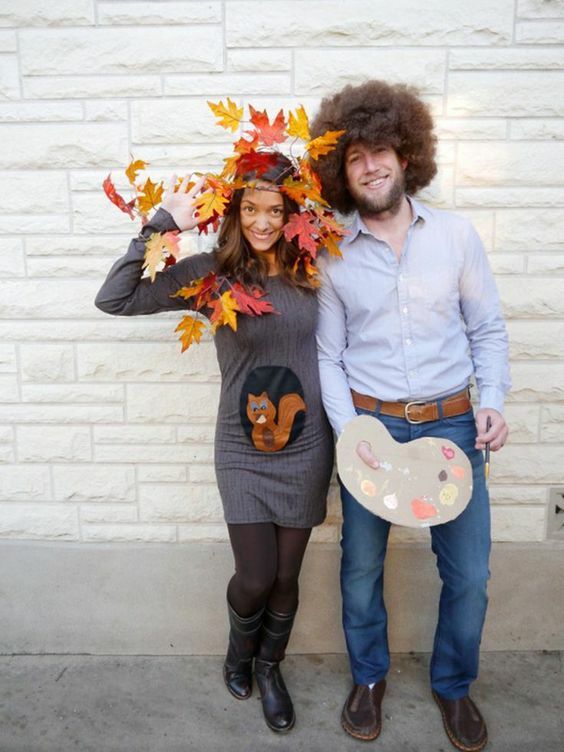 If you're going as a couple, turn your travel dress into a "happy little tree". Genius. 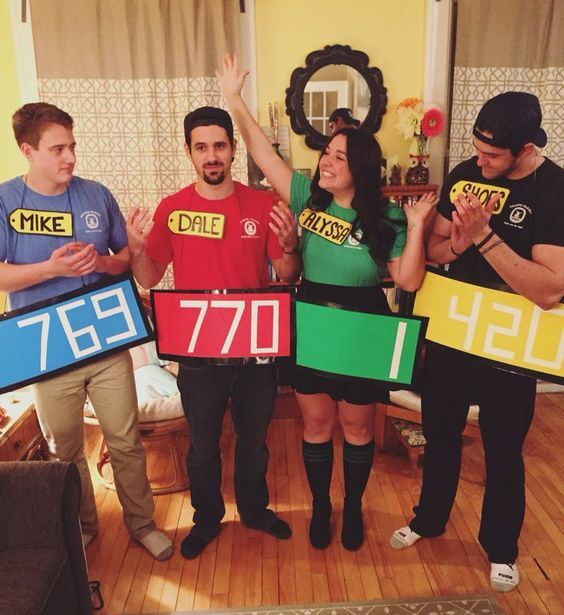 We had friends who did this combo at our Halloween party last year and it was fantastic. This is another new favorite among my friends: sauce bottles. 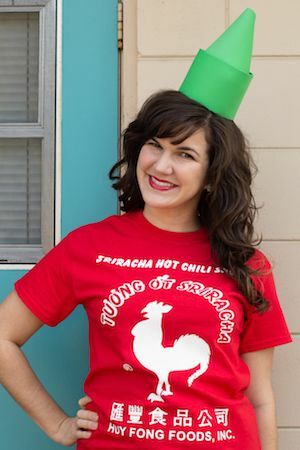 You can find shirts of your favorite sauces, like Sriracha, Tabasco, soy sauce and more (or you can make your own), add a matching hat or make a headband cap and you're done! It's super comfortable and looks like you put a lot of thought into it. I'll be wearing my Harry Potter witch wear this weekend for Rose City Comic Con, so look for pics on my Instagram if you want some inspo. What are your favorite go-to easy costumes? Disclaimer: this post contains an affiliate link and I will be financially compensated should you order through that link.